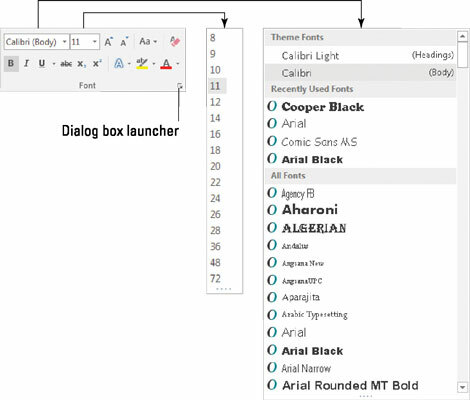 On the lower left side of the Font group in Word 2016 you find some of the most common character formats that enable you to change the appearance of your text. These formats enhance the selected font or typeface. Bold, italic, and underline are among the most common text character formats. To make text bold, press Ctrl+B or click the Bold command button. Use bold to make text stand out on a page — for titles and captions or when you’re uncontrollably angry. To make text italic, press Ctrl+I or click the Italic command button. Italic has replaced underlining as the preferred text-emphasis format. Italicized text is light and wispy, poetic, and free. Underline text by pressing Ctrl+U or clicking the Underline command button. You can click the down arrow next to the Underline command button to choose from a variety of underline styles or set an underline color. The double-underline format is available from the Underline command button’s menu, but it does have a keyboard shortcut: Ctrl+Shift+D. Also available is word-underlining format. Word underlining looks like this. The keyboard shortcut is Ctrl+Shift+W. Why did strikethrough text make it to the Font group? Small caps should be up there instead. Strikethrough is commonly used in legal documents, when you mean to say something but then change your mind think of something better to say. Click the Subscript command button to make text subscript. The keyboard shortcut is Ctrl+= (equal sign). Subscript text appears below the baseline, such as the 2 in H2O. To make text superscript, click the Superscript command button. The keyboard shortcut is Ctrl+Shift+= (equal sign), which is the shifted version of the subscript keyboard shortcut. Superscript text appears above the line, such as the 10 in 210. Another popular format, but apparently not popular enough to sport a command button in the Fonts group, is small caps. The small caps keyboard shortcut is Ctrl+Shift+K. Bill. That’s a clever way to smuggle a live grenade into prison. The All Caps text format sets the text to uppercase letters only. As with small caps, this format doesn’t feature a command button, although it has a shortcut key: Ctrl+Shift+A. To find all these text formats and more, open the Font dialog box shown at the beginning of this article. All character formats work like a toggle switch. Use the command to apply a text format. Use the same command again to remove that format. Text-formatting commands affect text as you type. They can also be applied to a block of text. More than one character format can be applied at a time to any text. For example, use Ctrl+B and then Ctrl+I to apply bold and italic formats. The best way to use superscript or subscript is to write text first and then apply the superscript or subscript format to selected text. So 42 becomes 42 and CnH2n+1OH becomes CnH2n+1OH. If you apply superscript or subscript as you type, the text tends to be difficult to edit. When will the Underline text attribute die? Microsoft must be waiting for the last typewriter-clutching librarian from the 1950s to pass on before underlining is officially gone as a text attribute. And please don’t fall prey to the old rule about underlining book titles. It’s Crime and Punishment, not Crime and Punishment.